I’ve been reading some old posts over at the old site for the blog and I’ve come to a conclusion: I’m moving back. Sorry, but the WordPress site leaves me cold somehow. I still can’t find my way around it, haven’t worked out how to do the simplest tasks like putting up links and the “Howdy” thing irritates me more than I expected. So we’re back to The Edge of Nowhere classic – or retro, if you like – and that’s here. I may even get around to writing something. Krummi the pony is one of nature’s nice guys and an occasional visitor to the pig farm where he gets on like a house on fire with Teddy and Merlin. Krummi is an Icelandic pony, about twice the size of your average Shetland and about four times bigger than Merlin. He’s a good-looking lad too and, as he stands with Westray wind whipping through his mane, you can half-imagine an axe-wielding Norseman charging into battle on him. But poor old Krummi has, up to now, had a terrible problem. . . at least, it’s a problem if you visit a pig farm. He was scared of pigs. Now, those who spend rather more time with horses than is good for them tell me this is some sort of primeval fear by a flight animal (the horse) for a predator (the pig – yeah, really). I wish someone would point this out to Merlin. Anyhoo. . . Krummi would stop dead and refuse to go any further whenever he was about to pass the pigs which made living arrangements something of a headache when he came to stay. 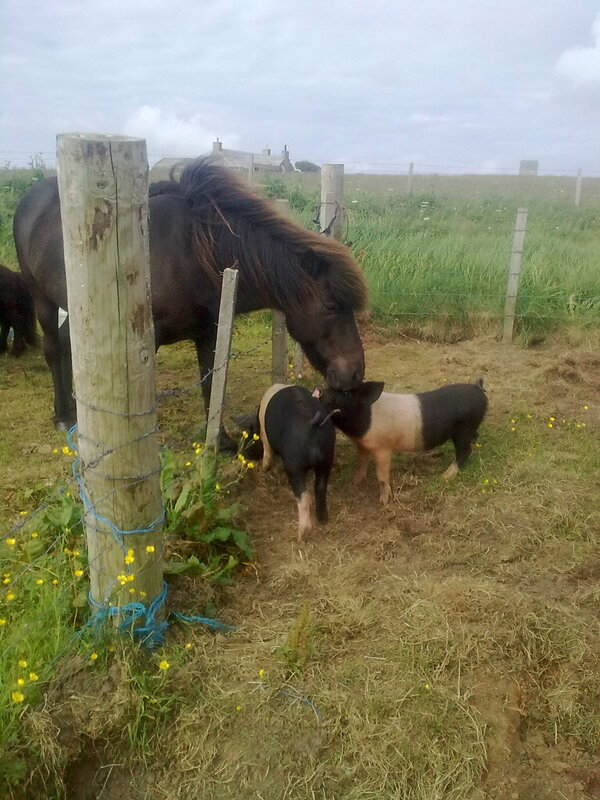 So I was expecting problems when he arrived for his latest short stay as Ted and Merlin were in a paddock next to the eight five-month-old porkers. However, they are a very cheerful, friendly bunch and Krummi soon wandered over to the fence to investigate or – more likely – try to get a mouthful or two of pig feed. . . cute, isn’t it? “I’ve got a terrible headache,” said Mrs Pig Farmer, getting in from work the other day. “There are some ibuprofen in the drawer, or I can go and pick some camomile and make you a cup to tea,” said the pig farmer. “It’s about knee-deep where the pigs were last winter. Camomile’s very good for a headache, according to hippies. A bunch of keys jangles. . . heavy door creaks. Footsteps cross the bare floorboards. A match strikes and a lamp brings dim light to the room. The thud of a large tome being laid on a desk. Dust is blown off. Pages turn. The cap of an ink bottle is unscrewed. The nib of a pen starts to scratch. . .
Or something like that, anyway. Yeah, it’s been a while, but I’ve been ever so busy what with the pigs, the house, the stupid football team putting me through the wringer again, my 5oth birthday and the in-laws descending en masse. So, with all that, who’s got time to blog? Not that it’s put some of “the audience” off. Today 12 of you have checked out the site which just goes to show that there’s a dozen of you who really need to get out in the fresh air more often. There’s plenty to catch up on which you may or may not be interested in and I’ll try to sort that out over the next few days. But I’m just back in from a smashing walk in the warm evening Westray sunshine and Mrs Pig Farmer has made me a Margarita (Tequila, lime and Triple Sec, salt on the rim of the glass) so I’ll try to be brief. We’ve been up to a favourite haunt Castle Burrian – a large rock stack a mile or so from our house. The main point was to see some of the 200 or so puffins that hang around there. The best time to see the puffins is late in the evening, around 10pm, but after a hard day being bothered by pigs that’s a bit late to be perched on a breezy cliffside so I’ve never been there at that hour. Many tourists do go, the island tour guide collects from wherever folk are staying and runs them up there, so I assume there’s some sort of parade. You know, puffin brass bands, puffin acrobats, puffin unicyclists, clown puffins with a little car that falls apart. . .
It’s the very least the modern tourist should expect of a top class holiday destination. But I’ve never been that late, so I don’t know for sure. What I do know is that we had a leisurely stroll in the earl;y evening sunshine, saw a good few puffins out at sea, on the wing and going in and out of burrows with sand eels in their beaks. We also saw gannet, fulmar, black-back gull, razorbill, shag (quiet at the back), and kittywake. But the biggest treat was by the gate at the start of the cliff path where on a large field recently cut for silage, oystercatchers, various gulls and more than 300 curlew (yes, I counted) were feeding. The old fella stirred sleepily in his basket as the pig farmer reminded him it was gone 11 and chucking out time. He showed no signs of wanting to wake up properly, let alone be turfed out of the kitchen into a draughty barn. So I picked the basket up and carried him out to the workshop area of the barn and placed him gently in a quiet corner on top of the washing machine. He stirred, looked up and tucked himself back in. And that was the last time I saw Trevor. We’ve hunted neighbouring fields and derelict buildings, asked neighbours, put up a poster in the local shop and shouted myself hoarse, but he’s not been seen since April 2 and I’ve long since resigned myself to the fact he’s not coming back. Trev first turned up 13 years ago, brought back to Sally’s house in Wolverhampton by her youngest son and, cheerfully ignoring the fact they were leaving for a holiday in Tenerife two days later, the decision was made to keep him. Even more determinedly independent than most cats, Trevor became a family favourite very quickly, doing exactly what he wanted, when he wanted. Long-time readers of the blog will recall his move from Wolverhampton to my house in Shrewsbury and then the long haul with me in the van up to Orkney a couple of years later. The full story is here. Once safely in Orkney, Trevor settled in, enjoying the open spaces and becoming king of the barn, although proving absolutely useless at catching mice (that’s townies for you). And even with the arrival of Frida the feral-turned-very tame cat, he seemed happy enough in a grumpy old git kind of way. Trev – who also couldn’t “miaow” properly – had used up several of his lives already and now it looks as if his ninth has gone the same way. I miss him. Molly the sow has been outside for a month, recovering from bringing up our latest batch of piglets. She has spent much of the time pounding up and down, spreading her bedding all over the place and escaping. Business as usual, then. I’d been thinking it was about time Molly and Alfie got to know each other. Given an age gap of more than four years and that Molly has considerable ‘previous’ when it comes to her attitude to young boars, I didn’t expect it to be in any way easy. I set up a kind of electrified no-man’s land between Alf’s paddock and the one I planned to put Molly in and went indoors for lunch. Tea and cheese sandwich later, I went outside again to see that the pigs had taken matters into their own hands and Alf was enjoying his own Mrs Robinson moment. . . not that I recall Anne Bancroft busting through a screen of pallets and two electric fences to get at Dustin Hoffman. Mind you, it’s been quite some time since I saw the film. Alf was looking particularly pleased with himself and Molly was just as keen so the pair of them were at it most of the afternoon. . . you’ve never seen so much slobber in all your life. Anyway, they’re happily settled in together and, if my calculations are correct we should be getting a litter of pedigree Saddleback piglets on August 11. Sunday afternoon on “the farm” and I’m out in the vegetable garden, pottering around, trying to get the beds tidied up and weed-free. I’ve extended a couple of the beds which has involved digging out a fair bit of turf and there’s nothing little piglets like better to play with than lumps of turf. It’s good for them too, providing iron until they go outside and get all the turf, soil and mud they want. So I jab a nice big piece with the garden fork, shake off the excess soil and set off around the corner to the pig shed, casually disregarding the bright blue water pipe that crosses my path. Size nine welly engages with blue pipe and gravity does its thing. The descending pig farmer lets go of garden fork which arrives on the ground shortly before the very top of my shinbone which connects with the fork handle. I attempt a word, but the wind has been knocked out of me and I lie there, aware of the growing pain in my knee, speculating on the ageing process and trying to remember a time when I could take a knock. Over the next couple of days my knee swells, leaving anything but the most straightforward tasks impossible. Now, nearly two weeks later it has improved, but a couple of hours strenuous work leaves me with the sensation of someone trying to lever my kneecap off with a screwdriver. They never tell you about this on Gardeners’ World.